I had never actually heard of fiddllehead ferns, also known as fiddlehead greens, until I had dinner at Brushstroke a few weeks ago. The vegetable was served tempura style with asparagus as a complement to smoked duck. I instantly loved the slightly bitter fern and especially liked how pretty it was. So when I saw these on sale at Whole Foods, I started googling how to cook them and all the recipes were simple and promising. Fiddlehead ferns are a spring vegetable, and their season is very short. The North American species grows mostly on the Atlantic Coast, in New England and Canada. They are not mass cultivated, but foraged for and apparently each plant grows seven fern heads and it is recommended to pluck three at most to allow the plant to keep propagating. Most of us can’t really tell the edible ones from the inedible, so the foraging is still left to the experts. They are fairly expensive when exported, but can be found frozen and pickled when out of season. They also tend to be bitter, and some people have reported cases of food poisoning. But even with all this negative press, I took the chance on these bad boys and decided to cook up a batch for dinner. 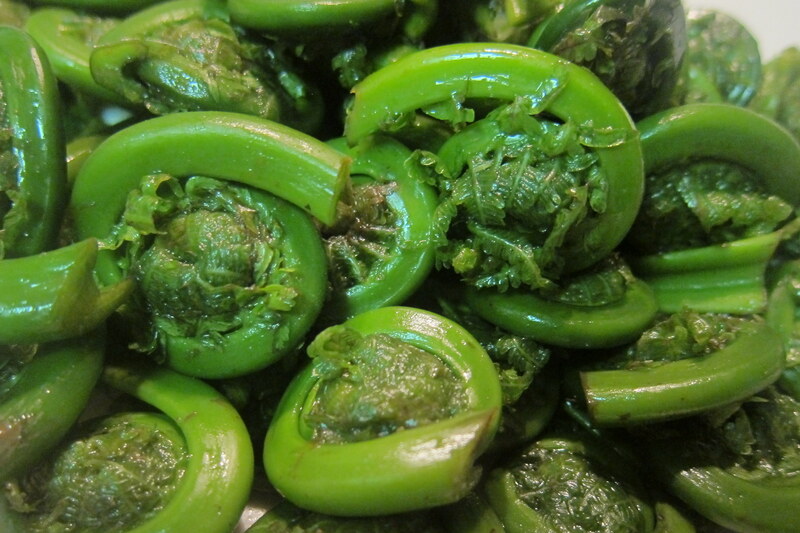 I used guidelines posted on Mark’s Daily Apple to cook the fiddlehead ferns and was happy with the results. I used them to complement my Rack of Lamb with Caramelized Shallot and Thyme Crust and Roasted Asparagus. Although the flavors of the asparagus and the ferns are similar, I just liked the shape and texture variety from an aesthetic perspective. Wash the fiddlehead ferns thoroughly and strip them of the brown bits and trim the stalks (the stalk is the most bitter part). Boil some water, toss in the ferns and let them boil for about 4 minutes. Meanwhile, prepare an ice bath and dump the ferns into the bath after the time runs out. You have now blanched the ferns and kept the lush green color. 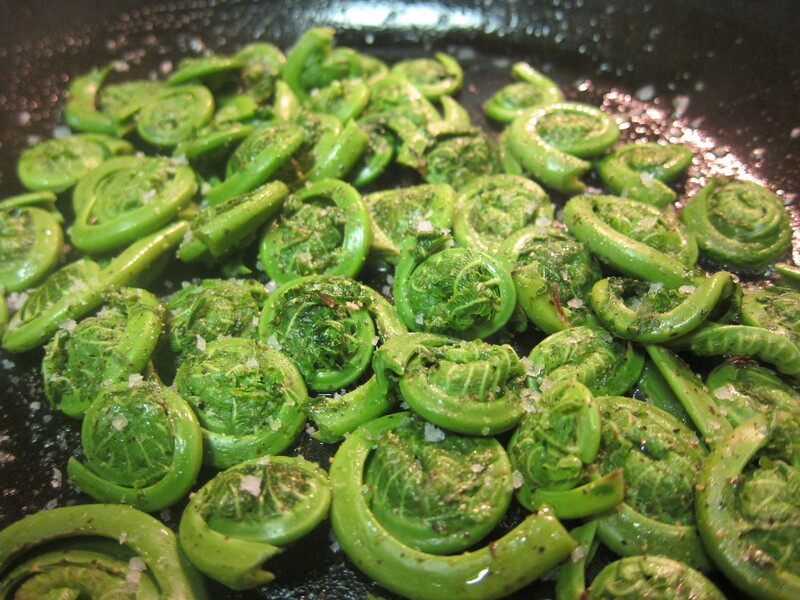 Heat up some butter (just eyeball it) and sauté the fiddlehead ferns for a few minutes, gently tossing them. Sample them as you go along to make sure the bitterness is gone, but do not overdo it as they become mealy. Once ready, sprinkle with some salt and pepper and serve. 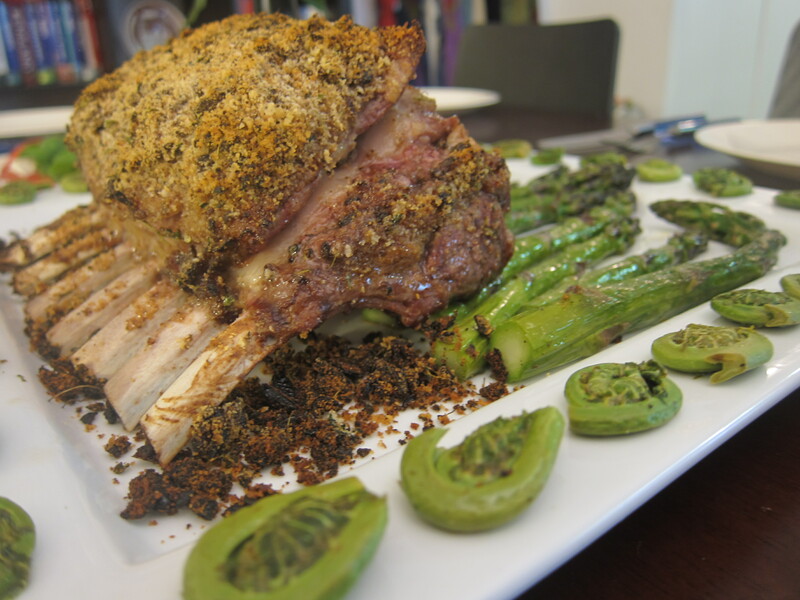 I suggest serving the ferns with a Rack of Lamb with Caramelized Shallot and Thyme Crust and Roasted Asparagus. Don’t know about fiddle head ferns either but the rest of the meal, OH Baby!